Our Lord had already taught that to be His disciple, it was necessary to be detached from material goods. He now asks for a deeper detachment. One must renounce self, one’s own ego, and what is most personal. But for a disciple of Christ every act of self-giving includes an affirmation to cease living for oneself so that “Christ may live in me” (Gal 2:20). Life in Christ “for whose sake I have suffered the loss of all things”(Phil 3:8), as St. Paul writes to the Philippians, is a real consequence of grace. The whole of Christian living is an affirmation of life, love, and friendship. ”I have come that they may have life, and have it abundantly”(Jn 10:10). Christ offers us divine filiation and a sharing in the intimate life of the Most Blessed Trinity. What stand in the way of that wonderful promise is simply attachment to our own ego, our love of comfort, well-being and success. Thus mortification is necessary! It is not something negative, but rather detachment from self in order to allow Jesus to live in us. Hence the paradox: to live we must “die”. We must die to ourselves in order to live a supernatural life. “If you live according to the flesh you will die, but if by the Spirit you put to death the deeds of the body, you will live” (Rom 8:13). “If any man would come after Me…” To respond to the invitation of Jesus, who passes alongside us, we need to go forward step by step, continually making progress. We need to die a little each day, to deny ourselves, to “put off our old nature which belongs to our former manner of life” (Eph 4:22), to reject those works which separate us from God or make friendship with Him difficult. To achieve the holiness we are called to by God, we must bring under control our inclination to evil and our passions because, after original sin and also as a result of personal sins, they are no longer rightly subject to our will. 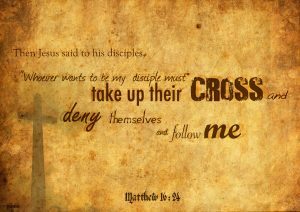 To follow Christ we must be master of ourselves and be able to guide our steps in a definite direction. As has been rightly said, we are like a man with a donkey, either the man leads the donkey or it leads him; either we control our passions or they control us. When there is no mortification, it seems as if our spirit were growing smaller, shrinking to a little point. And your body seems to grow and become gigantic, until it gains control. It was for you that Saint Paul wrote: ” I buffer my own body and make it my slave; or I, who have preached to others, may myself be rejected as worthless”(1Cor 9:27). St. Paul points out another reason for penance: “Now I rejoice in my sufferings for your sake, and in my flesh I complete what is lacking in Christ’s afflictions for the sake of His body, that is, the Church” (Col 1:24). Was Christ’s Passion not sufficient in itself to save? asks St. Alphonsus Liguori. Nothing was lacking in the value of His Passion; it was more than sufficient for the salvation of all men. And yet, to have the merits of Christ’s Passion applied to us, we need to co-operate, suffering patiently the toils and tribulations God may wish to send us, so as to liken us more closely to His Son, Jesus. When we are generous in practicing mortification we are the first to benefit from this sharing in the sufferings of Christ. Besides, the supernatural efficacy of penitence reaches our own family. It touches in a special way those most in need, our friends, and workmates, those people whom we wish to bring closer to God and, indeed, the entire Church and the whole world.